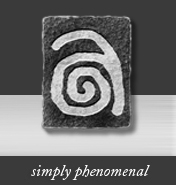 Anomalist Books | simply phenomenal | Outbreak! From fads, crazes, and manias to collective delusions, scares, panics, and mass hysterias, history is replete with examples of remarkable social behavior. Many are fueled by fear and uncertainty; others are driven by hope and expectation. For others still, the causes are more obscure. This massive collection of extraordinary social behaviors spans more than two millennia, and attempts to place many of the episodes within their greater historical and cultural context. Perhaps the most well-known example of unusual collective behavior occurred in 1938, when a million or more Americans were frightened or panicked after listening to a realistic radio drama about a Martian invasion of New Jersey, based on an adaptation of the H.G. Wells novel War of the Worlds. 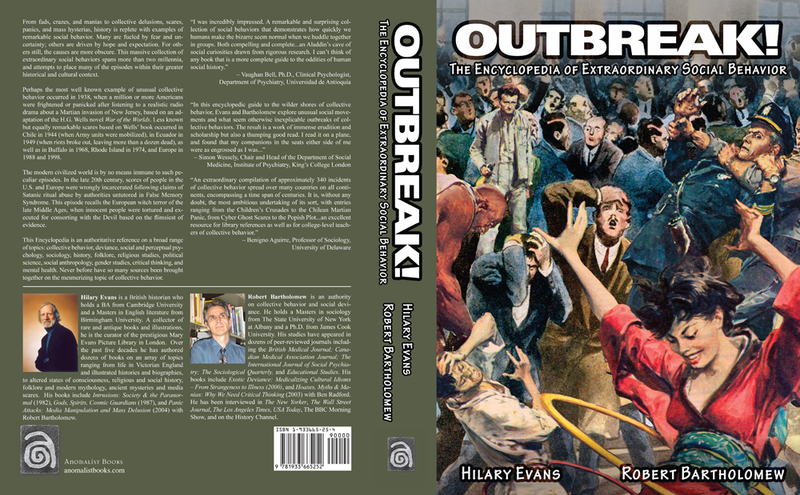 Less known but equally remarkable scares based on Wells’ book occurred in Chile in 1944 (when Army units were mobilized), in Ecuador in 1949 (when riots broke out, leaving more than a dozen dead), as well as in Buffalo in 1968, Rhode Island in 1974, and Europe in 1988 and 1998. The modern civilized world is by no means immune to such peculiar episodes. In the late 20th century, scores of people in the U.S. and Europe were wrongly incarcerated following claims of Satanic ritual abuse by authorities untutored in False Memory Syndrome. This episode recalls the European witch terror of the late Middle Ages, when innocent people were tortured and executed for consorting with the Devil based on the flimsiest of evidence. 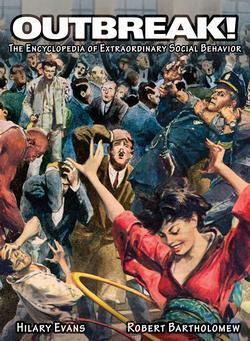 This Encyclopedia is an authoritative reference on a broad range of topics: collective behavior, deviance, social and perceptual psychology, sociology, history, folklore, religious studies, political science, social anthropology, gender studies, critical thinking, and mental health. Never before have so many sources been brought together on the mesmerizing topic of collective behavior. Hilary Evans is a British historian who holds a BA from Cambridge University and a Masters in English literature from Birmingham University. A collector of rare and antique books and illustrations, he is the curator of the prestigious Mary Evans Picture Library in London. Over the past fi ve decades he has authored dozens of books on an array of topics ranging from life in Victorian England and illustrated histories and biographies, to altered states of consciousness, religious and social history, folklore and modern mythology, ancient mysteries and media scares. His books include Intrusions: Society & the Paranormal (1982), Gods, Spirits, Cosmic Guardians (1987), and Panic Attacks: Media Manipulation and Mass Delusion (2004) with Robert Bartholomew. Robert Bartholomew is an authority on collective behavior and social deviance. He holds a Masters in sociology from The State University of New York at Albany and a Ph.D. from James Cook University. His studies have appeared in dozens of peer-reviewed journals including the British Medical Journal; Canadian Medical Association Journal; The International Journal of Social Psychiatry; The Sociological Quarterly, and Educational Studies. His books include Exotic Deviance: Medicalizing Cultural Idioms – From Strangeness to Illness (2000), and Hoaxes, Myths & Manias: Why We Need Critical Thinking (2003) with Ben Radford. He has been interviewed in The New Yorker, The Wall Street Journal, The Los Angeles Times, USA Today, The BBC Morning Show, and on the History Channel. An ebook edition is now available from Google Play. Because this is such a large book with many photographs, it could not be made available through our normal ebook vendors. This ebook is actually a PDF of the print book. VERY IMPORTANT: This ebook does not have flowing text and therefore is not readable on smartphones and small tablets. But it's fine for laptops, desktops, and large (iPad-sized) tablets. Read an interview with Robert Bartholomew in USA Today. The book has also been mentioned on ABC News Online, and in The New York Times and The Guardian.